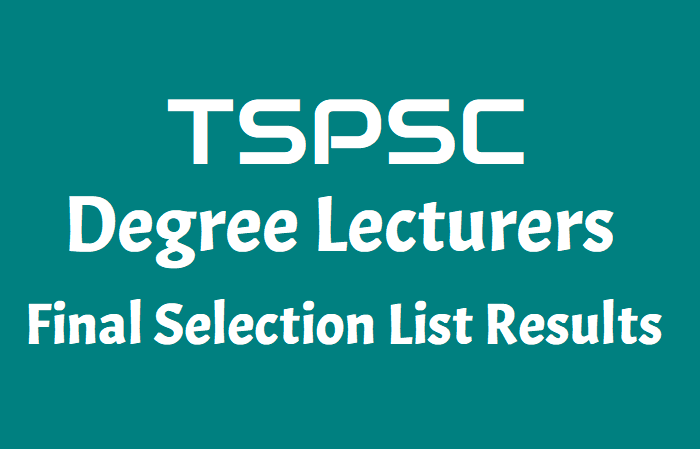 TSPSC Degree Lecturers Final Selection list Results (Selected Candidates list): TSPSC has released the Degree Lecturers Final Selection list Results (Selected Candidates list) on November 24. The provisionally selected Lists of the candidates who attended the Interviews for 20 Subjects of Lecturers in Degree Colleges of various Residential Education Institutions Societies notified vide notfn no. 22/2017 are placed on the Commission’s website. It is hereby notified that on the basis of the results of main examination `to 19-11-2018 at TSPSC Office, Hyderabad to the post of DEGREE COLLEGE LECTURERS IN TSWRDC AND MJPTBCWREIS, the following Hall ticket numbers have been provisionally selected for appointment to the post of DEGREE COLLEGE LECTURERS IN TSWRDC AND MJPTBCWREIS vide Commission’s Notification No.22/2017, Dt: 02-06-2017. The selectionsare published here with subject to the following conditions. Note: 1. The (04) vacancies are unfilled due to non-availability of eligible candidates. furnished false information or the selection is not in order due to any act of omission or commission of any candidate, then her/his provisional selection is liable to be cancelled at any stage and they will forfeit all consequential mbenefits including that of selection, besides that, the Commission reserves the right to take any action as it deems fit in the circumstances of the case, in terms of the provisions as notified in TSPSC Rules of Procedure published in Telangana State Gazette No. 60., Dt: 28/12/2015. With this Notification of selection, the General Recruitment process notified vide Notification No: 22/2017 for the post of DEGREE COLLEGE LECTURERS IN TSWRDC AND MJPTBCWREIS has been finally concluded for the above subjects. TSPSC Degree Lecturers Final Selection list Results (Selected Candidates list): TSPSC has informed that the Commission conducted Oral Test (Interviews) from 08/11/2018 to 19/11/2018 for the recruitment to the post of DEGREE COLLEGE LECTURERS IN TSWRDC AND MJPTBCWREIS vide Notification No. 22/2017. The list of provisionally selected candidates for the above post is available on the Commission’s website www.tspsc.gov.in . 7. Economics, 8. Geology, 9. Physics, 10. History, 11. Electronics, 12. Computer Science, 13. Public Administration, 14. Bio-Chemistry, 15. English, 16. Chemistry, 17. Nutrition & Dietitics, 18. BioTechnology, 19. Food Science.. In continuation of the above the selection Notification dt. 24/11/2018 for 20 subjects in notification No. 22/2017 which was kept in abeyance is now restored based on the orders of the Hon’ble High Court. The candidates may see the selection notification dt. 24/11/2018 of the following 19 subjects (Except Political Science). which will be shortly modified with holding one post in compliance with orders of Hon’ble High Court in W.P. 41225/2018. Step 3: 20 Subjects : Subject wise Final Selection List of Degree Lecturers links list will be appeared in this pagge. TSPSC has notified that on the basis of the results of main examination held on 18-05-2018 and 19/05/2018 and Oral test (Interview) held from 08-11-2018 to 19-11-2018 at TSPSC Office, Hyderabad to the post of DEGREE COLLEGE LECTURERS IN TSWRDC AND MJPTBCWREIS, the following Hall ticket numbers have been provisionally selected for appointment to the post of DEGREE COLLEGE LECTURERS IN TSWRDC AND MJPTBCWREIS vide Commission’s Notification No.22/2017, Dt: 02-06-2017. The selections are published here with subject to the following conditions. If it comes to the notice of the Commission later that any candidate furnished false information or the selection is not in order due to any act of omission or commission of any candidate, then her/his provisional selection is liable to be cancelled at any stage and they will forfeit all consequential benefits including that of selection, besides that, the Commission reserves the right to take any action as it deems fit in the circumstances of the case, in terms of the provisions as notified in TSPSC Rules of Procedure published in Telangana State Gazette No. 60., Dt: 28/12/2015. The selections are subject to the final outcome of W.P.No’s. 43275 of 2018 and 42893 of 2018 and other cases pending, if any, before the court where similar orders are passed in OA/WP. TSPSC Degree Lecturers Final Selection list Results (Selected Candidates list): On the basis of the results of main examination held on 18-05-2018 and 19/05/2018 and Oral test (Interview) held from 08-11-2018 to 19-11-2018 at TSPSC Office, Hyderabad to the post of DEGREE COLLEGE LECTURERS IN TSWRDC AND MJPTBCWREIS, the following Hall ticket numbers have been provisionally selected for appointment to the post of DEGREE COLLEGE LECTURERS IN TSWRDC AND MJPTBCWREIS vide Commission’s Notification No.22/2017, Dt: 02-06-2017. The selections are published here with subject to the following conditions. TSPSC Degree Lecturers Interviewed Candidates Marks List Results: TSPSC has released the Degree Lecturers Interviewed Candidates Marks List Results on November 20. The Consolidated Marks Lists of the candidates who attended the Interviews for 20 Subjects of Lecturers in Degree Colleges of various Residential Education Institutions Societies notified vide notfn no. 22/2017 are placed on the Commission’s website. TSPSC Degree Lecturers Interviewed Candidates Marks List Results has been placed on its website. Step 3: 20 Subjects : Subject wise Marks List of Degree Lecturers links list will be appeared in this pagge.